If you’re in the process of building a screen enclosure for your Atlanta home, you’ve probably picked out the basic materials. But have you considered what type of screen to use? 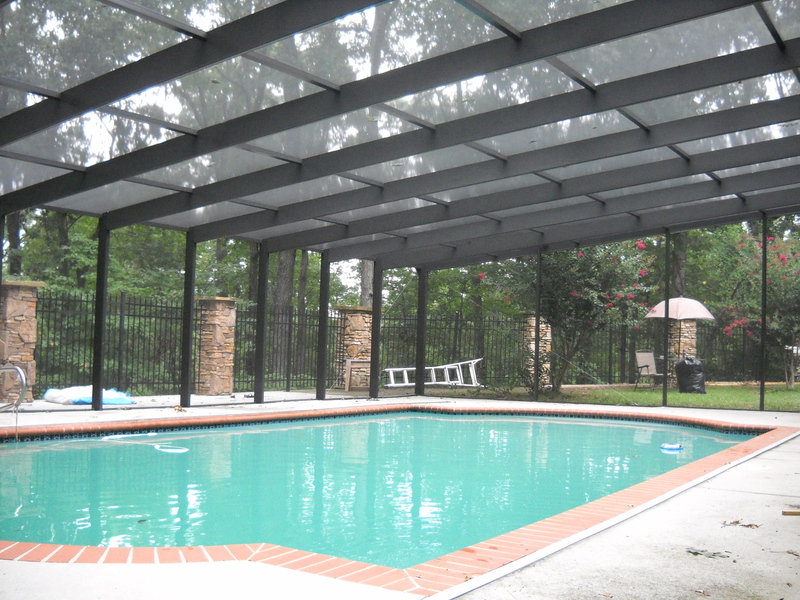 Since those of us who live in the Atlanta area are lucky enough to benefit from great weather three-quarters of the year, a screened in pool enclosure can be the perfect choice. It’s less costly than a glass enclosure, and not only will you have a nifty space to unwind and entertain, but you’ll also have plenty of privacy. 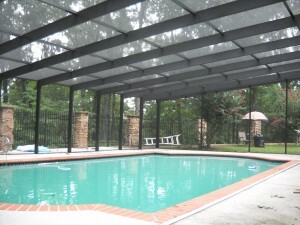 And did you know that even a screened enclosure can protect you from some of the sun’s harmful rays? While there are many things to consider while designing a pool enclosure, such as panels, frames, color and overall style and construction, the screen may be the most important element to select. There are different varieties of screens to choose from that depend greatly on the type of enclosure you’re planning, as well as your overall budget. While most standard screens are often made out of fiberglass, there are different varieties made of other kinds of materials that will also keep out insects and protect your pets. Yes, we just mentioned insects, they’re everywhere, especially during the summer, but did you know that specialized insect screens can help keep these pesky critters out of your pool enclosure? Another great thing to know is that the panels can be installed individually for easy removal to not just remove insects, but other items such as pollen and other potential obstructions that can be harmful. Screens can get damaged and tear…it’s a given, which is why there are several kinds of heavy-duty screens available. These particular screens are often made from extremely durable polyester that features UV tolerant characteristics that prevent fading and will last up to three times the length of regular strength screens. These types of screens are usually treated with biocides, which are chemical supplements that can help to prevent any form of mildew expansion. Seeing as you’re building a pool enclosure, you’ll certainly want to capitalize on the power of the sun, which is where solar screens come in handy. These high performance solar screens are made out of dark, light and high performance reflective fabrics, all of which provide excellent heat control, glare control, and most important, UV protection. These types of solar screens are very effective in preventing up to 70% of glare and heat. If it’s privacy you’re after, there is a special type of privacy screen that miraculously obscure the view of your pool enclosure from the outside…meaning that nobody can see inside. Constructed out of vinyl-laminated fiberglass, this particular screen offers an obscured glass appearance, while also helping to keep out external items such as dirt, bugs and even your neighbors and their kids. And if you have pets that like to break free and run loose in the yard, a Pet Screen might just do the trick to keep them safe. Considerably heavier than other screens, this particular screen is made of tear resistant vinyl coated polyester, that is stronger than typical fiberglass and aluminum screens. Varieties of this type of screen are coated with Microban, an antimicrobial product that kills microorganisms that can be harmful to pets. Contact DC Enclosures today for a complementary in-home consultation, and get on your way to an enjoyable pool enclosure for your Atlanta home!